The partnership between humans and animals dates back to the first domestication of animals in the Stone Age, as long as 9,000 years ago. But never have animals provided such dedicated and particular help to humans as they do today in the form of trained service, or assistance, to people with disabilities. These animals, usually dogs, help people accomplish tasks that would otherwise be prohibitively difficult or simply impossible. Service animals are not pets but working animals doing a job; thus, legislation such as the Americans with Disabilities Act (1990) in the United States and the Disability Discrimination Act (1995) in the United Kingdom makes service animals exempt from rules that prohibit animals from public places and businesses. 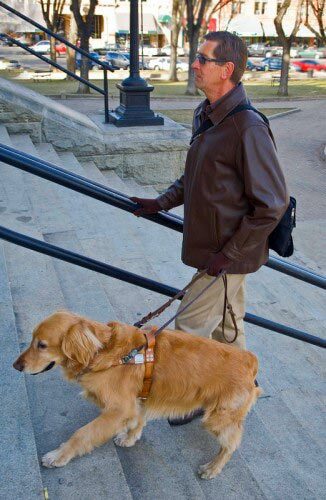 The most familiar service animals are guide dogs who help visually impaired people move about safely. 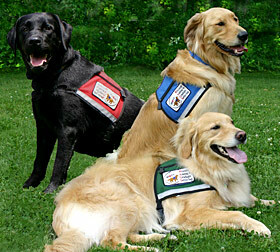 Systematic training of guide dogs originated in Germany during World War I to aid blinded veterans. In the late 1920s Dorothy Harrison Eustis, an American dog trainer living in Switzerland, heard of the program and wrote a magazine article about it. The publicity led her to her first student, Morris Frank, with whose help she established a similar training school in the United States in 1929, the Seeing Eye (now located in New Jersey). Guide-dog puppies are often bred for the purpose by the various organizations that train dogs. German shepherds, Labrador retrievers, and Labrador-golden retriever crosses are the most widely used breeds because of their calm temperaments, intelligence, natural desire to be helpful, and good constitutions. Puppies spend their first year with foster families who socialize them and prepare them for later training by teaching them basic obedience skills. At the age of approximately 18 months, guide dogs enter formal training, which lasts from about three to five months. During this period the dogs learn to adjust to a harness, stop at curbs, gauge the human partner’s height when traveling in low or obstructed places, and disobey a command when obedience will endanger the person. In recent years, hearing dogs have become increasingly common. These dogs, usually mixed-breed rescues from animal shelters, are trained to alert their human partners to ordinary sounds such as an alarm clock, a baby’s cry, or a telephone. The dogs raise the alert by touching the partner with a paw and then leading him or her to the source of the sound. They are also trained to recognize danger signals such as fire alarms and sounds of intruders—again, by touching with a paw and then lying down in a special “alert” posture, at which time the human partner can take appropriate action. Dogs can be trained for a great variety of assistance purposes. 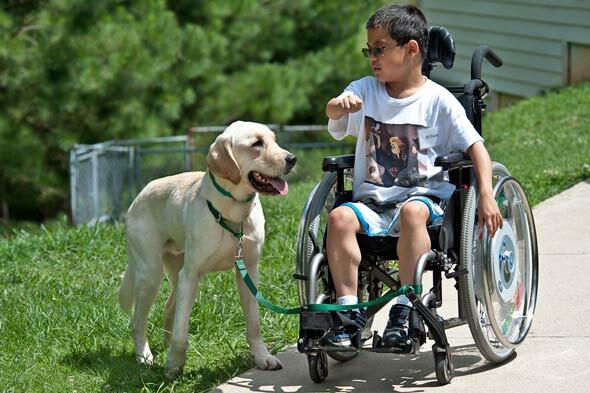 For example, Great Plains Assistance Dogs Foundation trains several categories of assistance animals, including service dogs, who help people who use wheelchairs and other mobility devices; hearing dogs; seizure-alert or -response dogs, who help persons with seizure disorders by activating an electronic alert system when symptoms occur (some can even predict the onset of a seizure); and therapeutic companion dogs, who provide emotional support for people in hospices, hospitals, and other situations in which loneliness and lack of stimulation are continual problems. There are many programs that train and certify pet animals, especially dogs and cats, as “therapy animals” who visit such institutions and bring much-welcomed companionship to patients. Animals are also used in programs such as animal-assisted therapy (AAT). In the words of the Delta Society, AAT is a “goal-directed intervention” that utilizes the motivating and rewarding presence of animals, facilitated by trained human professionals, to help patients make cognitive and physical improvements. For example, an elderly patient in a nursing home might be given the task of buckling a dog’s collar or feeding small treats to a cat, activities that enhance fine motor skills. Goals are set for the patients, and their progress is measured. Dogs and cats are not the only animals who can assist humans with disabilities. Capuchin monkeys—small, quick, and intelligent—can help people who are paralyzed or have other severe impairments to their mobility, such as multiple sclerosis. These monkeys perform essential tasks such as turning on lights and picking up dropped objects. One of the more unusual assistance animals is the guide horse. An experimental program in the United States trains miniature horses to guide the visually impaired in the same way that guide dogs do. The tiny horses may be an alternative for people who are allergic to dogs or who have equestrian backgrounds and are more comfortable with horses. Certain dogs and other animals have special skills similar to those of the seizure-assistance dogs, such as the ability to detect a diabetic’s drop in blood sugar and alert the person before danger occurs. The sometimes uncanny natural abilities of animals can benefit humans in many ways. 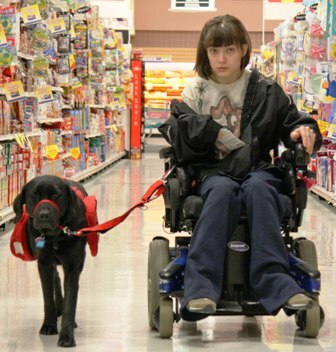 Reputable organizations that train assistance animals also take steps to ensure that the animals are cherished and lead rewarding, enjoyable, and healthy lives. When the animals’ helping careers are over, provision is made for their well-deserved retirement. 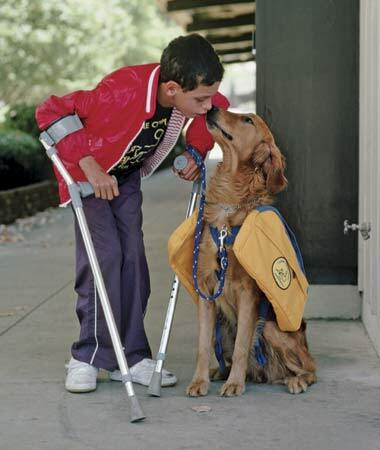 Image: Boy with cerebral palsy and his assistance dog; Tom Nebbia/Corbis.